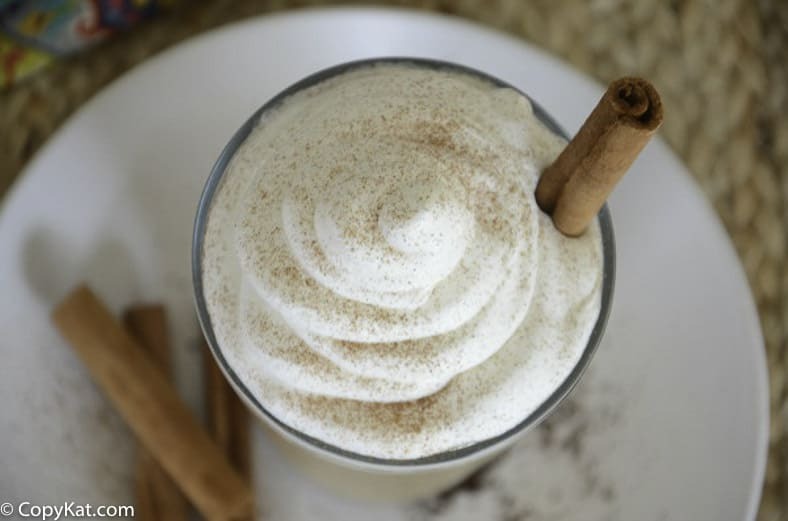 Cool down with a copycat Starbucks Horchata frappuccino anytime of year with this recipe. Starbucks has a large line-up of frappuccino drinks. Some are seasonal, like the smores frappuccino, and some are offered year round. Ones like their caramel, vanilla bean and double chocolate chip frappuccinos are offered all the time. I know you are going to find the Starbucks Horchata Frappuccino completely refreshing, and it happens to be dairy free. Recently Starbucks introduced a new frappuccino to their menu – the horchata frappuccino! 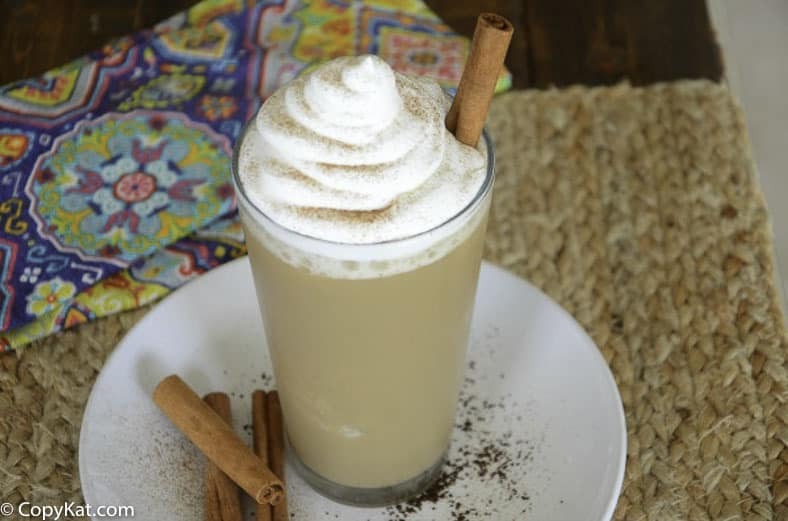 Horchata is a traditional Mexican drink made with rice and cinnamon. The rice is steeped overnight in water to create the base of the drink. It is rich, creamy and so refreshing served over ice. Although this frappuccino is named after the rice drink, Starbucks says it is “inspired” by horchata and not a copycat drink recipe. They do not use rice in their version and instead of milk use almond milk in the mix. 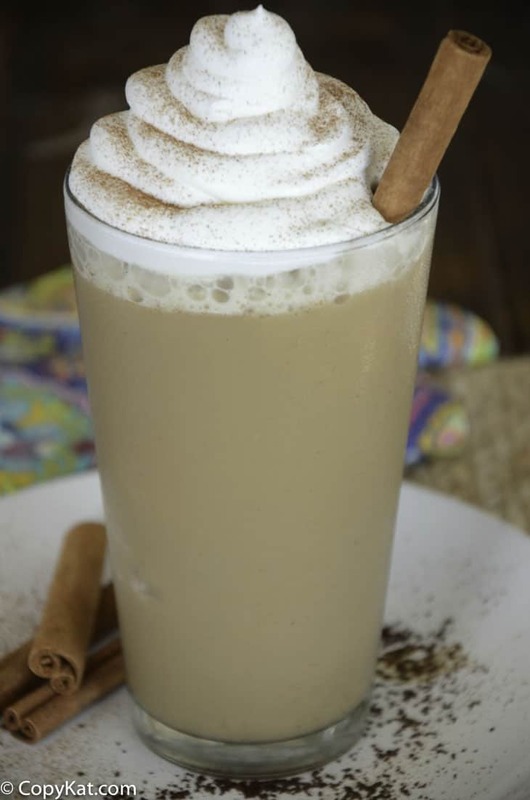 The almond milk creates an almost rice like flavor and makes this frappuccino dairy free! Since the Starbucks Horchata Frappuccino drink recipe does not use rice, it is easy to make at home whenever you want! You may even have most of the ingredients in your home. The almond milk may be the only thing that some would have to buy since it’s the most unique ingredient in the recipe. This frappuccino is great for anyone who enjoys the cinnamon dolce latte drink that Starbucks offers. It uses the same syrup to create the horchata inspired flavor. You can make the syrup at home and always have it on hand. The recipe below makes more then you will need for the frappuccino, so be sure to save it for later! The Starbucks Horchata is a refreshing drink you just have to try. Syrup directions In a small sauce pan, mix the brown sugar and cinnamon together. Add the water and simmer for 5 minutes, or until it coats the back of a spoon. Remove, allow to cool and store in an airtight container.Drink directions In a blender, combine all the ingredients. Blend until smooth. Top with whipped cream and cinnamon, if desired. The most addictive drink from Starbucks! I loved this, it’s completely refreshing for summer. Never mind; I got it ! Didn’t know the syrups name. Sorry! And thank you!DELICIOUS!! How much syrup do you use per drink ? The whole thing?